Sorry if you’re a little squeamish, but this is too cool to share. Although, I don’t suppose the caterpillar shares my enthusiasm. Last week I found a tobacco hornworm feeding on the leaves of one of my tomato plants. Today I spotted another one. This this one had a problem—a serious problem. See those white things riding on its back? Those are cocoons of a braconid wasp. 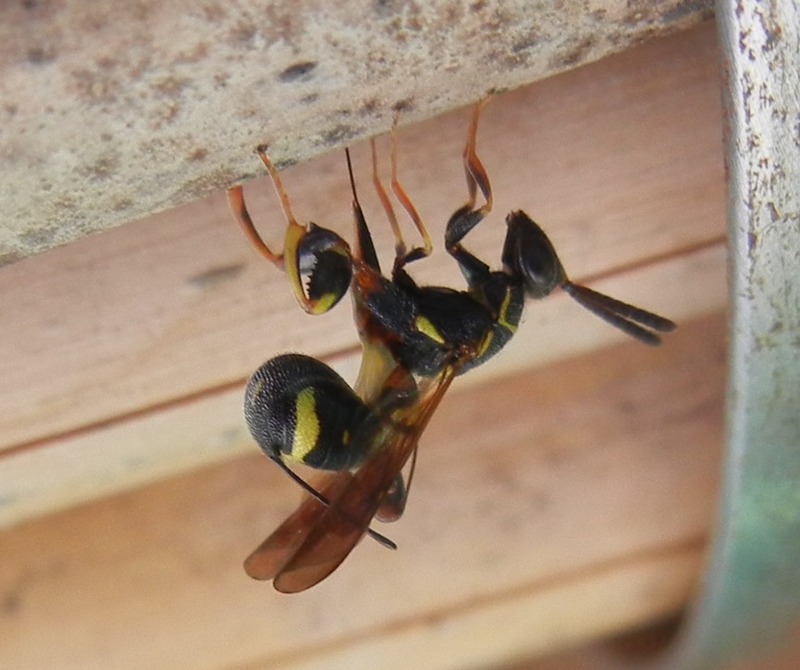 The Braconidae is a large group of parasitoid wasps. 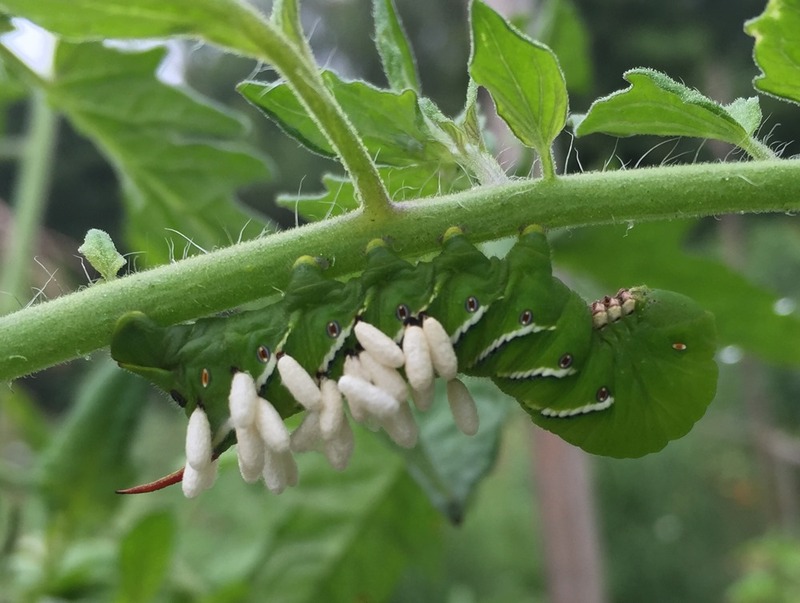 There is at least one that uses tomato and tobacco hornworms as a host for it’s little babies. It injects its eggs under the skin of the caterpillar. When they hatch, the larvae burrow around inside the poor sucker munching as they go until they’re big enough to pupate. Then they pop through the skin, spin a white cocoon of silk and transform into adult wasps that can go on and do that same to more hornworm caterpillars. Isn’t Nature wonderful! 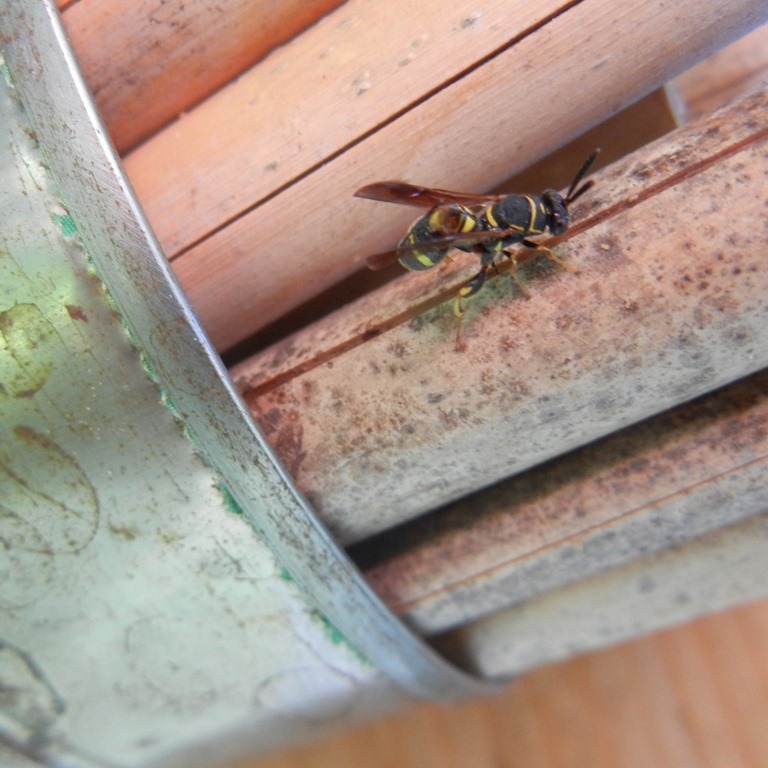 The infestation usually kills the host earning the wasps the parasitoid label rather than calling them parasites. I didn’t dispose of this caterpillar like I did with the other one. Here is an opportunity to practice some completely organic pest control. I left them to go about the next stage in their lifecycle protecting the tomato plants of the community garden. I was just outside on the deck and noticed something flying around the mason bee hotel. Since the tubes are almost all occupied I was curious who might be looking for a place to live. As I watched I saw a small wasp climbing around on the outside of the bamboo carefully inspecting them with her antennae. Then she assumed a rather arched posture and I assumed the worst. Yup, somebody’s laying eggs! If you look closely you can count her six tan feet versus one black, evil (if you’re the poor, parasitized pupa inside) ovipositor. When I looked around the other side I could clearly see the crack she had discovered and was exploiting. It’s a flaw in the fortress that will probably cost more than one mason be his or her life. Bummer. Yet it’s fascinating. This makes me think I should be changing out the bamboo each year. Replacing it will not only lessen the occurrence of vulnerable cracks, but also reduce the buildup of parasitic mites.